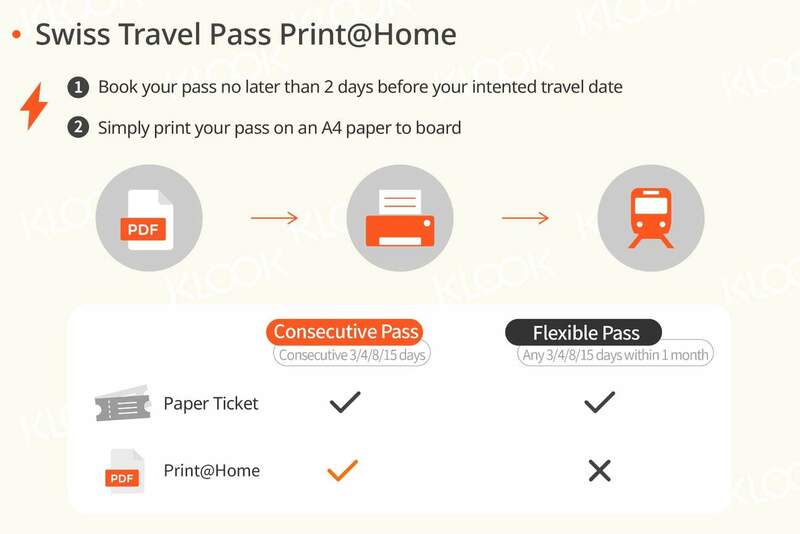 Klook Promo: Say goodbye to physical tickets and get back 5% of your purchase in Klook credits when you buy your e-ticket! Skip the delivery time with a Swiss Travel Pass E-ticket, which you can print by yourself at home! Read our Swiss Travel Pass Guide and find out the best things to do in Switzerland! Swiss pass is a must, you can travel and save a lot of money with the pass. Booking via klook is also easy with many promotion codes. Get US$11.4 back in Klook credits for your next trip when you book this activity! 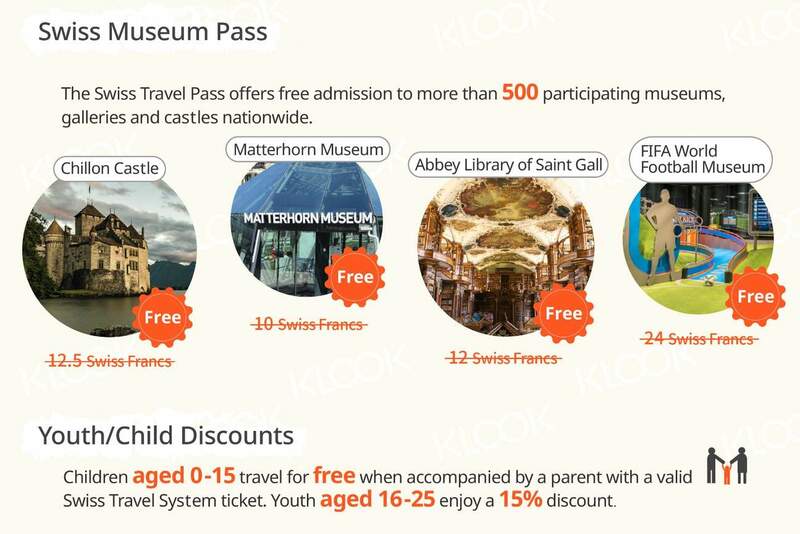 Complete this Klook activity to get 5% of the activity cost back in free credits to use on your next booking. For example, book US$228.85 to get US$11.4 free credits. 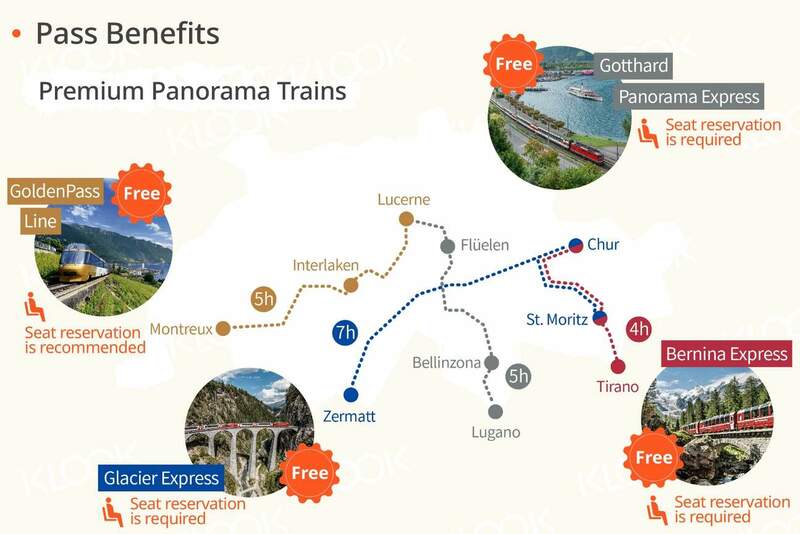 Explore the entirety of Switzerland, without having to worry about how to get from one place to another, by using an e-Ticket for the Swiss Travel Pass (Consecutive), which gives you access to unlimited rides on trains, boats, buses, and premium panorama trains across the country! Simply make a booking on the Klook website/app, then print out your pass on an A4 paper to activate it as soon as you've received your e-ticket/voucher. Once you're in Switzerland, just present your printed pass at the station of your choice and you'll enjoy unlimited transportation on the Swiss Travel System for 3, 4, 8, or 15 consecutive days. Hit the tracks at any time and any pace you desire, visiting Switzerland's most popular destinations like the lively city of Zurich or the Matterhorn Mountain in Zermatt, which inspired the now-iconic logo of Toberlone. Your Swiss Travel Pass also comes with other added benefits like free access to more than 500 different museums and galleries and discounts on other means of transportation! 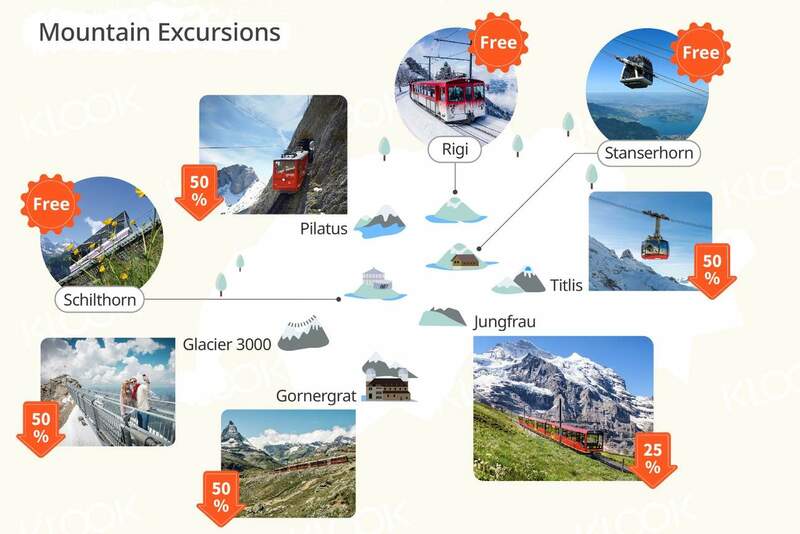 See the beauty of untouched nature with discounts on a variety of varying mountain excursions every year like Jungfrau, Glacier 3000, Pilatus, and more – enjoy these deals before the year ends! Skip the delivery time with the E-ticket version of the Swiss Travel Pass, totally fast and easy to use! You must show your pass and passport or proof of residence when the conductor comes around to check your ticket on the train. Never leave them at home! Very easy with this pass. Bought it during 12.12 sales. Use it for many trips with train. From Interlaken to Zermatt, Schiltorn, Grindelwald. From Zurich to Rhein falls, Luzern. Visit FIFA museum for free. Took boat trip also at Zurich lake. From Zurich to Chur-St Moritz-Tirano to enjoy the view before continue my trip in Italy. The view was realllly amazing. Please buy ticket to Kleine Scheidegg. We forgot, we just showed the pass and thr conductor asked us to buy at KS before going to Jungfraujoch. Very easy with this pass. Bought it during 12.12 sales. Use it for many trips with train. From Interlaken to Zermatt, Schiltorn, Grindelwald. From Zurich to Rhein falls, Luzern. Visit FIFA museum for free. Took boat trip also at Zurich lake. From Zurich to Chur-St Moritz-Tirano to enjoy the view before continue my trip in Italy. The view was realllly amazing. Please buy ticket to Kleine Scheidegg. We forgot, we just showed the pass and thr conductor asked us to buy at KS before going to Jungfraujoch. Can go up to the schilthorn summit and thrill walk for free. Can travel where ever u want. Be it zermatt or lusuanne. You'll be there in a few hours. 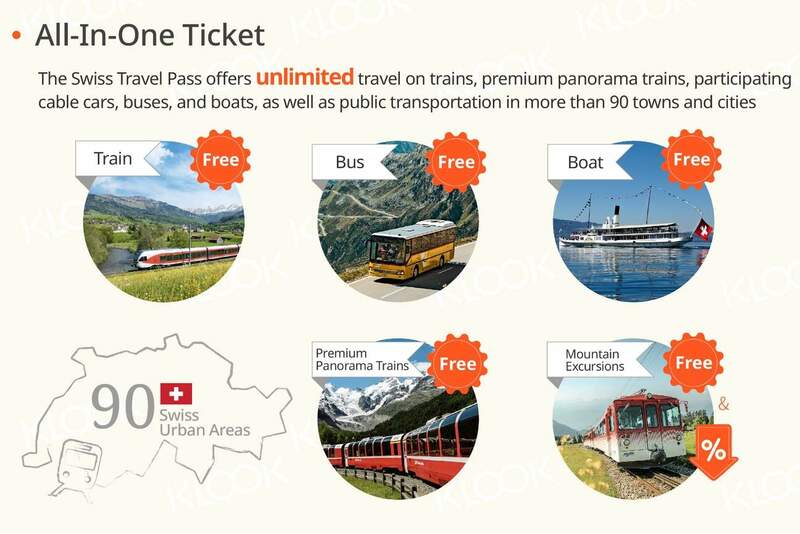 And you can enjoy free golden pass scenic train ride for free. No reservation needed. Totally worth the price. Can go up to the schilthorn summit and thrill walk for free. Can travel where ever u want. Be it zermatt or lusuanne. You'll be there in a few hours. And you can enjoy free golden pass scenic train ride for free. No reservation needed. Totally worth the price. You can use the mobile eticket and print out the hard copy for the train staff check ticket. I love this swizz travel pass very much , it not only for train pass but you can aldo visit many museum and mt rigi for free!!! You can use the mobile eticket and print out the hard copy for the train staff check ticket. I love this swizz travel pass very much , it not only for train pass but you can aldo visit many museum and mt rigi for free!!! Really convenient to use and ease of problem to buy any ticket since it cover almost all public transport in Swiss. Just print out after you get online voucher from Klook. Really convenient to use and ease of problem to buy any ticket since it cover almost all public transport in Swiss. Just print out after you get online voucher from Klook. With swiss travel pass you can just hop on hop off the bus, train, boat & other tptn under sbb. It really worth having it n you can travel much easier. With swiss travel pass you can just hop on hop off the bus, train, boat & other tptn under sbb. It really worth having it n you can travel much easier. Quite good, especially if you want to trip around in Switzerland in less than a week. Couldn't ask dor more if you take a trip to museums, trip by train, tram, bus, and half-fare scenery train. Quite good, especially if you want to trip around in Switzerland in less than a week. Couldn't ask dor more if you take a trip to museums, trip by train, tram, bus, and half-fare scenery train. Swiss travel pass is the best train pass i would like to recommand to use when visiting Swiss. No need to buy train ticket every time and the pass also include free entry for museums and mountains. Swiss travel pass is the best train pass i would like to recommand to use when visiting Swiss. No need to buy train ticket every time and the pass also include free entry for museums and mountains. klook app is very useful, reliable and user friendly, most importantly is the price is cheaper. Swiss travel pass is very convenient, no need to buy train tickets when you are in hurry, just present the QR code when checking. Besides, the train tickets in Swiss is super expensive, using this swiss travel pass can save a lots. Will definitely book from klook again in the future. klook app is very useful, reliable and user friendly, most importantly is the price is cheaper. Swiss travel pass is very convenient, no need to buy train tickets when you are in hurry, just present the QR code when checking. Besides, the train tickets in Swiss is super expensive, using this swiss travel pass can save a lots. Will definitely book from klook again in the future. Swiss pass is a must, you can travel and save a lot of money with the pass. Booking via klook is also easy with many promotion codes. Swiss pass is a must, you can travel and save a lot of money with the pass. Booking via klook is also easy with many promotion codes.